Heads you win, tails we lose. Is this a guiding principle in the privatisation of Australia’s biggest infrastructure project, WestConnex? As laid out in our “Blind Faith” investigation, the government of NSW has tilted the playing field in favour of WestConnex bidders thanks to a scheme to artificially make the tollroads longer, and by jacking up both the number of roads tolled and the tolls themselves. Leading transport analyst and actuary, Ian Bell, explains how taxpayers and motorists bear more of the risks while the prospective buyers stand to enjoy more of the benefits. Bell also discusses the failure of government to consider rail alternatives and the potentially spectacular benefits of “platooning”, which could increase profits dramatically with driverless cars. Why, he asks, does the state not take an equal share in the financial “upside” of this enormous project? When you pay off your home mortgage, you stop making your payments to the bank. The bank leaves you alone. When a tollroad is paid off, motorists keep paying tolls and the tollroad operator keeps making a profit. But what of government? Should not the government, and therefore taxpayers, get their fair share of profits from these Public-Private Partnerships (PPPs)? NSW could learn from Victoria, and from Queensland too, when it comes to privatisation and toll-roads. When Melbourne’s City Link project was paid off, instead of terminating the concession (as per the original contract) and stopping the tolls, the government renegotiated with the owner Transurban to continue tolling for a negligible consideration. The Age newspaper once suggested the amount was $10 million but why and how this deal occurred have never been explained. Now Transurban is effectively sitting on a gold mine paying no royalties and little tax either. Former premier of Victoria, Jeff Kennett, had anticipated the potential for toll revenue growth and built flexibility into the concession period. If debt was repaid and agreed hurdles were met for equity holders, the government had the right to terminate the concession early. This was a great way to achieve value for money for motorists and taxpayers. Somehow though – and presumably without adequate strategic advice – the subsequent government of Steve Bracks accepted amendments to the deal to the detriment of motorists and taxpayers. Transurban was given the full concession term. It may even be about to be extended. You could say customers get a better deal from their banks than do states from their tollroad operators, despite the expert advice they have on call. Surely NSW, in prosecuting the sale of WestConnex, could learn from Victoria and insist on a similar early termination mechanism along the Kennett lines. Then there is the BrisConnections story. BrisConnections was the spectacularly unsuccessful share market float to raise money to build Brisbane’s Airport Link project. The government was in cahoots however, in for both a share of the risk and a share of the rewards. The bidding process included mechanisms to share in super profits from the deal, super profits made by the new owners. Victoria’s $1 billion per kilometre road – who wouldn’t rail against that? Ironically, Airport Link fell into receivership thanks to overcooked traffic forecasts; although it should be said that a similar fate has befallen most tunnelled tollroads in Australia. Cost of tunnelling is around $1 billion per kilometre. To put the case then for the private bidders for WestConnex, there is a lot of development and business risk and this will put a dent of many billions of dollars in the sale price of Sydney Motorway Corporation, of which the state intends to sell a controlling 51 per cent stake. Besides the immense project risks are the immense rewards to be earned from tolling Australia’s biggest city. Will NSW Premier Gladys Berejiklian learn from the experience of Jeff Kennett and Steve Bracks? “Out of the money” is a term used by share options players in financial markets. It means that, at current data values, there is no pay-off to the holder of the legal rights underlying an option contract even though, at forecast future data values for the commodity over which the option exists, there may be a future payoff. What does this mean for a project like WestConnex? WestConnex is all about maximising traffic and therefore toll revenues. Premier Berejiklian and her colleagues are introducing road-pricing by stealth. They want motorists to keep paying motorway tolls into the distant future, even after the new owners have achieved their market-based returns. Even banks don’t try this trick with their home loan customers. There is a counterpoint to this, which apparently has been worked somehow, though still largely opaquely, into the bidding process for sell-down of Sydney Motorway Corporation’s rights to WestConnex tolling concessions. It’s called “upside profit sharing”, and Australia has some history of it, although it is patchy and not exactly an achievement of which our state governments should be proud. It refers to ways in which the benefits of future tolled traffic which exceeds forecasts are dealt with, whether these are shared with the private concessionaires as annual rebates or subject to more sophisticated financial mechanics. A tolling concession can contain options to the grantor (the State) and an “upside profit share”, it is not that much different to a set of pay-offs on a series of call options. 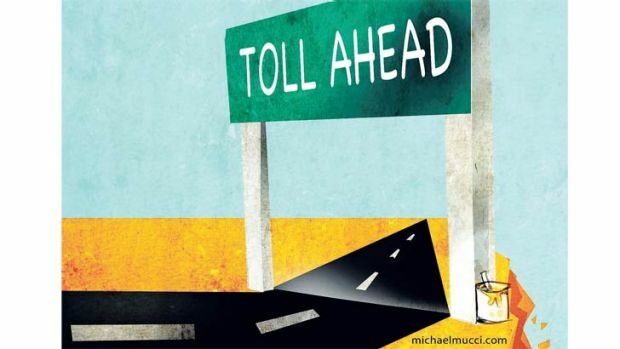 The biggest pay-off on a state’s call option is if toll levels are maintained after the concession expires, but even a share of extra revenues during the concession term is a form of call option pay-off. It benefits taxpayers but not the motorists paying tolls. Just how will the public share in this upside? After all, they are currently funding the future uncertainties, in the sense that they have all the future traffic forecast risks —at least until that 51 per cent or more of Sydney Motorway Corporation (SMC) is sold to one of the four bidders now left in the auction. But after that, what will happen? Queensland – a case of L-Platers? Or really smart behind the scenes? Let’s look at one guide, the case of the Brisbane Airport Link M7 Motorway, perhaps Australia’s most notorious financial failure. From the first day it listed on the ASX it was clear something was astray. As clients of Macquarie, who had been encouraged to participate in the float, realised there were two more instalments to come – that effectively you could lose twice the money you invested i the first place – they fled. 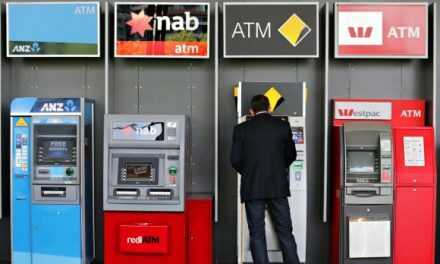 BrisConnections stock price collapsed and was pilloried in the press as Macquarie’s “Dead Parrot” model of financing. But on page 96 of that PDS, under section 9.7, investors could find that the Queensland Government was to get a share in the upside from traffic flows being higher than in the “base case” financial model. In the revenue share arrangements for this deal there were effectively options put in place according to traffic flows and years of operation. In the end, and even though the financing collapsed, it seems the state outsmarted the investment bankers by quietly understanding the traffic forecasts for the float had been over-cooked. It all came out later in a court case. Even by last year, five years after the road opening, Transurban, who swooped and acquired the carcass of this dead parrot, was only reporting about 60,000 vehicle trips per day, or less than one-third of what had been forecast by engineers ARUP at opening. The State taxpayers’ call option didn’t even provide a feather, but they did get the road at a discount. So what is the lesson for WestConnex? The problem is that, as already pointed out in Michael West’s article ‘Blind Faith – Unlocking the secrets of WestConnex’, the key parties, the government and the investors, are negotiating under an impenetrable blanket of secrecy. They are setting higher tolls too, from which they will both benefit, but they are not telling motorists the full story (see here and here). Those who do drive private cars on Sydney motorways to the tune of more than $25 per week of tolls will effectively get their own profit share cycled back by way of free rego, but that is limited and is such a strange response to needed road pricing policies that perhaps it won’t last that long. Sydney Morning Herald’s Matt O’Sullivan reported in his article ‘Leaked documents show Sydney’s F6 Extension to benefit new owners of WestConnex’ on January 3, that Roads and Maritime Services (RMS), and hence the State’s taxpaying public “will receive no benefit from funnelling traffic from the proposed F6 Extension on to the soon-to-be-sold WestConnex toll road”, despite a reported analysis of traffic modelling showing the planned F6 Extension Stage 1 ”…is likely to increase traffic and revenue for each of the three stages of WestConnex”. Further, a “leaked document shows the government will gain (only) a 30 per cent share in extra revenue from WestConnex only when the amount generated by tolls surpasses 130 per cent of that forecast in the business case for the project”, an arrangement that is said to be “generally less favourable to RMS than market”. The basis of that comparison is that for NorthConnex the State will get an upside profit share when traffic creates more than 110 per cent of base revenue. Of course, the nature of dealings on WestConnex seems to be that government has been pushing bidders to accept the highest possible traffic forecasts because higher forecast revenues should translate into a higher sale price for SMC shares. Does this mean state taxpayers’ share of upside on the deal will be even further “out-of-the-money”? That is, less and less likely to arise, as in the Queensland case? And does this all make sense as a strategy for getting value for money for taxpayers? It does seem that, contrary to what the State’s Auditor-General in 2006 sought after the Cross City Tunnel debacle, it is no longer the case that “value for money for motorists (is) an explicit objective of the bidding process”. A subsequent NSW Auditor-General Tony Harris in a submission to the NSW Legislative Council 2017 Inquiry into Road Tolling called for a new model of risk allocation that would allow the government (not the private sector) to collect “super profits”. Why the government fails to listen to Auditors-General is another intriguing, but worrying, aspect of WestConnex. In the case of Australia’s first major toll road – Transurban’s Melbourne’s CityLink project – the Victorian Premier of the time, Jeff Kennett, had a solution to the matter of state upside. He insisted on some flexibility in the concession period so if at any of a given set of dates (the first being about 25 years into the life of the concession), all debt of the project had been repaid and the “Equity Return” upon termination at that point was to be 17.5 per cent or more (the definition of “super profits”), then the State could elect to terminate the concession and take back the road. Indeed, it could do this without necessarily cancelling all the toll arrangements. This would mean all the “super profits” which followed would go into state treasury. The state could clearly alter the toll rates then if it wanted to, as it would then have the flexibility which just did not exist while Transurban was in control. It did not work out that way. Transurban had a big win over government via a “market-led” proposal to build the WestGate Tunnel project, getting a 10-15 year extension to its CityLink concession as part of that deal. Melburnians were not happy. With Kennett gone, the Bracks government agreed to a deal for a paltry amount reported to be about $10 million. It let Transurban loose to buy other toll roads around the country and overseas, and it also let them off the hook on original conditions for repayment of debt, even if the Equity Return theoretically met the threshold Jeff Kennett had set. This amendment thereby completely negated the Victorian Government’s chances of bringing the CityLink concession to an earlier close — indeed, it now seems likely to be extended by another ten years instead. It is a case of the stewards of public assets being outwitted by bankers yet again. In Chile, they have experimented with what they call Flexible Term road concessions and there is now a global store of academic research on methods of running toll concession auctions to avoid later problems. (One of the future expected problems for WestConnex is that it may set up non-competitive arrangements for future extension or modification, and under NSW’s “unsolicited proposal” process create an effective exclusive right to SMC owners to build and join other roads to link to the system. ACCC where are you?) A flexible term concession is tantamount to what Jeff Kennett tried to achieve on Melbourne CityLink, except he had a final term limit. If the public were to get to see – even, say, through the confidential medium of a pricing regulator or independent auditor – the key parameters in a toll road Base Case Financial Model, it would be clear that conditions could be set such that Project Debt could be repaid, and a given (agreed) Equity Yield obtained, such that the financing parties got what they needed and the State then got the motorways back for its own subsequent decision-making on what to do next. Under a Flexible Term concession the need for 4 per cent minimum toll rate escalations might even be unnecessary. Under poor traffic forecasting, this type of scheme might see the WestConnex concession go beyond 2060, but under favourable traffic flows (to the owners, that is) the “Kennett call option” could see the expiry occur earlier than expected. This would clearly be better for NSW taxpayers, and possibly also for WestConnex motorists, than what appears to be in store in the SMC bidding process. Of course, that is not all that we see wrong with the WestConnex deal, but that too is fodder for another set of stories. After all, who’s to say that the current bidders can fund and manage the whole scheme cheaper than the State if they were smarter than both Victoria and Queensland. Ultimately, the State does have a much lower cost of capital than even Transurban, as ex-Auditor General, Tony Harris, has already also pointed out, and that should, under the right scheme design, make quite a significant difference. On a far more basic and important issue, why are we even talking about state investment in roads, rather than determining the future of Sydney’s rail network as a first priority, like a modern day Bradfield would no doubt do? 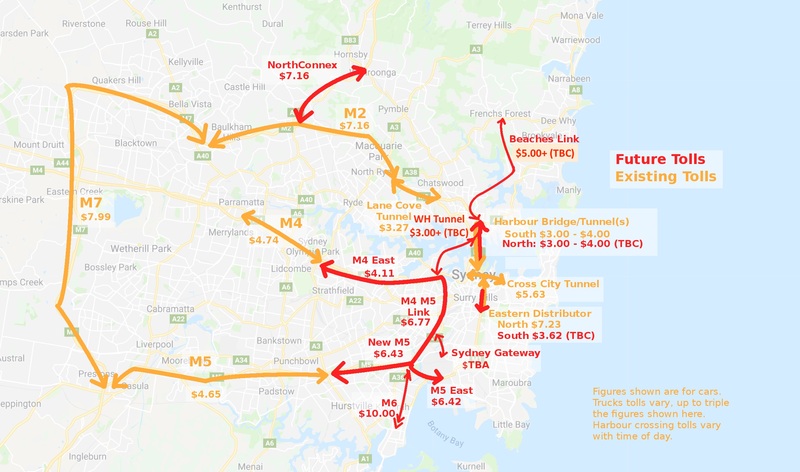 “On my rough calculations more than 50 per cent of the valuation of parts of the WestConnex system is likely to arise from the inclusion of motorways that were previously un-tolled (the M4, M5 East and, after 2026, the existing M5 South West tollway that they seem to have re-named the M5 West). Yet even if they get a good valuation ($20 billion, say, effective as notional completion value), all that really means is that they could have raised half of that large sum by enacting such tolls, hypothecating them into a future fund, then using the proceeds to invest in much-needed new rail rather than roads. And lesser monies could have instead been put into upgrading the A6 corridor, which is a more central north-south travel proposition, or alternatively the A3 corridor just as City of Sydney Council suggested”. Was this ever evaluated? Perhaps we’ll never know. So the really big issue in all this comes down to roads versus rail. Can the state fund all that is needed for Sydney’s rail network when it is trying to allocate some $50 billion to WestConnex plus its extra six toll tentacles and even the already committed parts of WestConnex could run over budget, as Aussie-built mega projects are wont to do? There are many questions. Will they delay or postpone the Metro West in order to give the road-builders and SMC bidders what they desire? Will they simply ignore the Commonwealth ambitions for WSA-linked north-south rail in the Western Sydney City Deal? And what about the other mass transit projects mentioned in the Transport for NSW Future Transport Strategy? What about the forever postponed higher speed rail links, for example, for Newcastle? What about the constantly delayed Maldon-Dombarton Link and speeding up the Illawarra Line for Wollongong rather than a huge costly tolled F6 Extension down to Loftus or Waterfall? Fairfax’s Peter Martin has already pointed out how rail enhancements down there could be materially cheaper than a new massive motorway and it would be effective enough to take lots of through traffic off the Cronulla-Sutherland to Mascot road route anyway, obviating the need for such high motorway spending. What we do know is that Transurban only does roads. It doesn’t do rail. Moreover, we do know from disclosures in Melbourne that Transurban are super keen on researching and exploring the potential of Autonomous Vehicles (AV’s) and even Connected Autonomous Vehicles (CAV’s). Here is a slide publicly released by Transurban via the ASX at an investo presentation back in May, 2016. 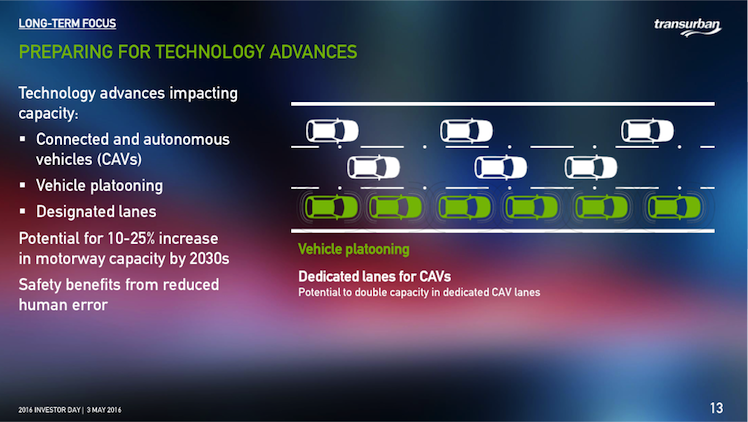 As can be seen, they told investors that the technology advances of CAV’s, the concept of vehicle platooning (sensor and software driven co-ordination) and dedicated lanes for CAV’s together had the potential for a 20-25 per cent increase in motorway capacity (meaning more vehicles per lane per hour) by the 2030s. So, for a straightforward motorway like the M4, a peak flow of 2,200 vehicles per hour [say] per lane could increase to [say] 2,650-2,750 under such a scenario. That extra flow rate means extra tolls to the same degree if demand expands to meet capacity (which it normally does, given time). Significant reductions in accidents and injuries. That is tantamount to nearly double current accepted lane flow capacity! So, does this mean that there will be no peak hour hold-ups on Transurban motorways when CAV’s dominate to the required extent for these lane flow increases? 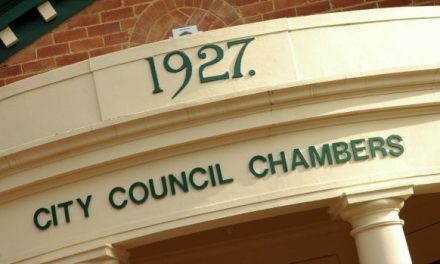 Or does it mean that SMC’s new owners (even if not Transurban) will “clean up” through the advent of technology combined with growth of population together with apartment-driven population density in Sydney, given that the State has not designed its motorway concession contracts in the right way in order to limit the effects of this free call option on new technological advances? A flexible concession term without the need for above-CPI toll escalation, combined with a “Kennett call” type provision would certainly protect taxpayers, but will our current Coalition Government be sufficiently astute to implement such a measure or something similarly effective, or instead just give up cheaply this potential bonanza? Not only that but by releasing Base Case Financial Model parameters, including some broad debt metrics, the public might understand better what has gone on behind closed doors in all of this. Ian Bell is an actuary and traffic expert and principle of Financial-Architects Asia. Bell has analysed Australian tollroads extensively.